We provide the best price cost fare Taxi Limousine Minivan from Nice Airport to Cannes and any destinations on the French Riviera. 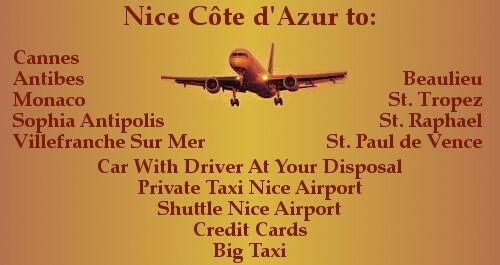 You can book or pre book a car, a Limousine, a Minivan, a bus service with driver at your arrival at Nice Airport. We have cheap, low cost high quality transfer from Nice Airport to St Jean Cap Ferrat, Beaulieu sur Mer, Sophia Antipolis, Antibes, Cap d’Antibes, Juan les Pins, St Tropez, St Raphael, Ste Maxime, Monaco, Menton, Biot, St Paul de Vence, Villefranche sur Mer Terminal Cruise, Port Grimaud, Theoule sur Mer. We have big taxi minivan for families with baby seats, we accept credit cards American Express,Visa, Mastercard on board Nice Airport. 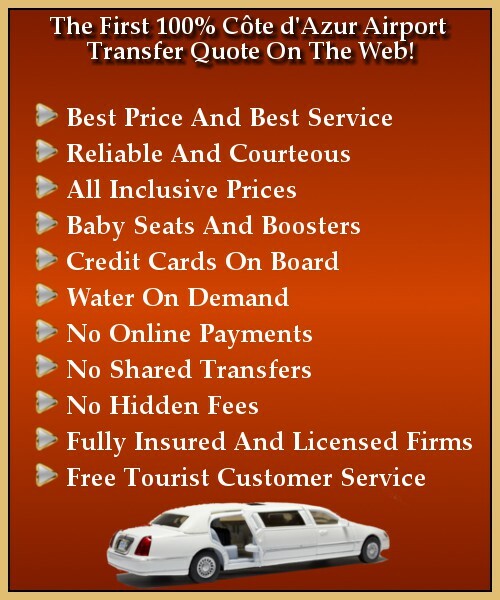 You can book or pre book a car, a Limousine, a Minibus with driver at your arrival at Nice Airport.